HT-414: Complete kit includes speaker adapters, grilles, 2 ohm speakers and all required wiring to go in fairing lowers on Twin-Cooled bikes Lower adapters provide easy access to the coolant reservoir, come in matte black and can be installed as is or color-match painted. Includes all required hardware and wiring to complete the installation. Supplied wire harness plugs into Hogtunes RM series amps, but is easily modified for other brands of amps. Fitment: 14-Up FLHTK, FLHTKL, FLHTUCTG, 16 FLTRU. NOTE: Required amplifier is not included. 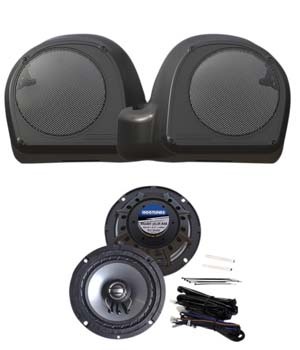 The only aftermarket speaker designed from the ground up specifically for Rushmore Ultra rear speaker boxes! 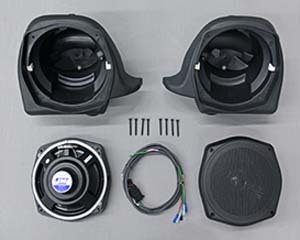 HLPS-725: Performance Series 7.25” drivers, are the largest diameter speakers that can be installed into the Harley LOWER fairing shells, with cone volume and mass comparable to a 6X9” speaker. 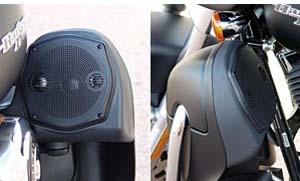 This new performance series speaker set has been designed specifically for the 2006-2013 Harley® Ultra or Harley StreetGlide/RoadGlide custom with the factory Harley Ultra LOWER faring shells installed. Spec’d at 2 ohms impedance and 140+ watts max power, these new speakers provide the ultimate in raw audio power from the lower fairing position. Waterproof injection-molded polycarbonate driver cone. High-flux strength but lite-weight dual-donut Neodymium magnet. Top-quality LOWER fairing housing inserts molded specifically to fit the vented Harley lower fairing shells with these 7.25" speakers. These high-impact quality molded speaker inserts are textured in a matt finish and can be painted to match the color of your Bagger. 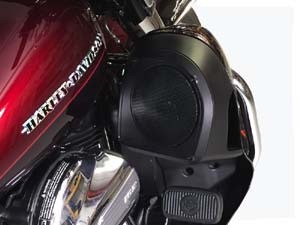 These are THE most efficient speakers you can buy for your Harley and they will perform extremely well when used with a medium-powered accessory amplifier. HLRK-725: New 7 ¼” round subs are the largest diameter speakers that can be installed into the Harley LOWER fairing shells, with cone volume and mass comparable to a 6X9” speaker. 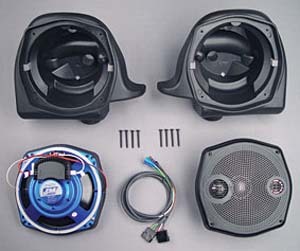 This new high-power three-way ROKKER series speaker set has been designed specifically for the 2006 current Harley® StreetGlide, Ultra, or RoadGlide custom with the factory Harley LOWER faring shells installed . Spec’d at 2 ohms impedance and 170+ watts max power, these new speakers provide the ultimate in raw audio power. Waterproof injection-molded polycarbonate woofer cone. High efficiency VENTED voice-coil for improved cooling when operating at high volume levels for extended periods. Custom designed grillwork with high-output titanium-colored tweeter and midrange drivers. Specially-tuned speaker-mounted passive crossover network for improved fidelity & frequency response. 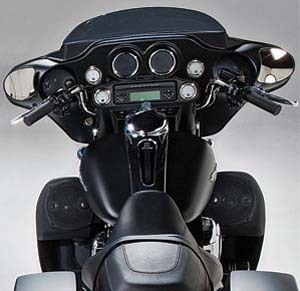 Top-quality LOWER fairing housing inserts molded specifically to fit the Harley lower fairing shells, to hold the ROKKER series 7.25” speaker and custom grill with mounted high-output tweeter and midrange. 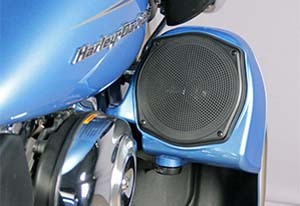 These are THE most efficient speakers you can buy for your Harley and they will perform extremely well when used with a medium to high-powered accessory amplifier.